This is the summary of consumer reviews for FroliCat BOLT Interactive Laser Pet Toy. 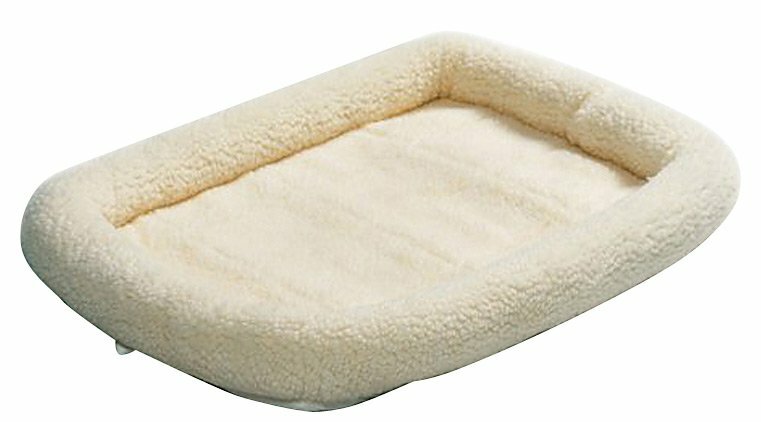 The BoolPool rating for this product is Good, with 3.70 stars, and the price range is $15-$20. 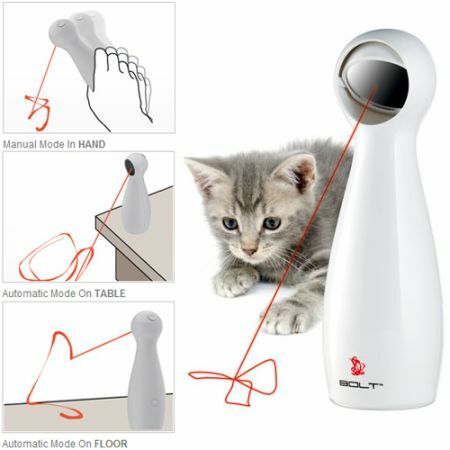 FroliCat BOLT Interactive Laser Pet Toy prevents the cats from getting bored and finding trouble. 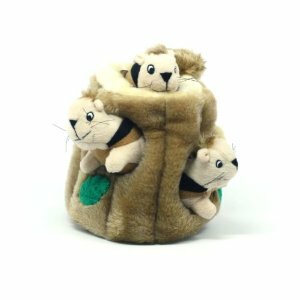 This little toy entertains the cats and keeps them busy as they focus on the laser dot and moving patterns. Some reviewers like that the beam periodically pauses so that cats get all ready to pounce and then they take off. This toy gets mixed reviews as many pet owners complain that the product is defective many times and can get boring for some cats. Overall, FroliCat BOLT Interactive Laser Pet Toy is an inexpensive toy for cats who love chasing laser beams. It can work in manual and auto mode. I recommend against buying this product. I don't recommend buying it. I'm on number 3 now, all have been dead on arrival for automatic mode. Stick to the FroliCat automatic mode since that's what it was designed for. Like many reviewers have stated, mine arrived and auto mode didn't work. For such a low price, I do recommend it. I smashed the hell out of it and won't buy anything from this company again. When you see the laser moving erratically and randomly in the video, that's what the description calls "manual mode." The laser only moves in a circle, very slowly, reversing direction at random. All in all, it's a good product for a laser-loving pet. Great laser toy for pets...love that the beam will stay on for 15 minutes and has automatic or manual controls. Also it's hard to control manaully because of the motor movement. When you can control the beam, the red dot, where it goes and how fast, at least my dog, seems to be much happier with the actual flashlight itself, and not this item. If I held it in my hand and moved it manually, my kitten would chase the beam, but this defeats the purpose of it being automatic. It also has no sensor system to detect when the cat's body has intercepted the beam and shift the location of the beam to compensate. What this device alleges to do is automate the process of a human being controlling a laser pointer to mimic the movement of a living thing, AND avoid the beam becoming invisible. Bummer, because honestly, well my VET had reccommended this product when I told him how much "Bella" my welsh corgi loved to chase the "red beam". The beam moves fast so there aren't many opportunities for kitty to "win". The mirror really offers little control -- just the height of the slow, circular pattern. The combination of the unrealistic motion and the beam "disappearing" whenever his body intercepted it caused him to quickly lose interest. The Bolt turns itself off after 15 minutes so I can turn it on when I go to bed to give them additional play time in the dark where it really shows up bright. She sits and barks at it when the fifteen minutes times out until someone turns it on again. The first time I turned it on I liked how my cat was into it but after a few minutes I couldn't stand it. My two cats LOVE IT - best purchase ever! as soon as i turned this on my cats went crazy and the best part is i dont have to shot the laser pointer around the room any more. When I went to turn it on again, only runs for about 10 minutes and then shuts off, the machine wouldn't turn on. It's zig zag-irradic design keeps the cats on their toes....they never now where it's going to turn up. Turn on the BOLT, then turn it upside down and give it a sharp rap on a solid surface. This item is a great toy for my two cats Sam and Dexter, Dexter has a bit too much energy in the morning so I turn it on for him and he just goes crazy chasing the laser around. He actually succeeded in turning it on a couple times, but usually it'd fall several feet to the floor. - My cat loves it! Mine loves the noise and watches it all the time. I love the randomizer action on it-- this causes cats to jump straight up. My laser loving cat will pay attention to it for a few moments. My cats love laser toys but I hated having to sit there and do it for them longer than a couple minutes. If this unit is running unattended how many times will this thing flash into your cats eyes? My cat has an obsessive love for the laser beam, so this toy is great! The border collie is also having a great time chasing the red dot. This toy wasn't successful at all with my cat (who at the time of buying this toy, she was about 4 or 5 months). Your cat willl play for hours. Product works great, auto turn off after 15 minutes. This entertained the cat for a good 15 minutes when it ran. Most of all I like that it's 15 minute timer so I can leave it on and let him (my cat) play and know it'll eventually turn off in 15 minutes or when my cat comes back to bother me to play with him. Because, well, my cat still grows bored of it after the 3rd or 4th 15 minute run. It runs for 15 minutes before automatically turning off, but because it pauses for too long between its rapid movement my two cats loose interest after about 5 to 10 minutes. My cats didn't really fancy this toy, within a few minutes they figured out that they were never going to catch the little light, laid down and watched it circulate for a few minutes more and then gave up entirely. My cat absolutely loves this product! Our kitten gets bored after about 5 minutes but then 5 minutes after that starts meowing and looking at it until we turn it back on. Two stars for the 5 minute amusement. My cat loves laser light toys, but this FroliCat BOLT didn't capture her attention like I thought it'd. My cat loves this toy.He plays with it everyday. This laser light is one of the best toys that I've gotten for my cats. Now, he'll play and play until he drops. She's so much fun with this light and I enjoy watching her play. Every evening we turn the lights down and let them have a good play session. The fact hat they light continues to move stimulates him and he'll play with it for a good 10-15 minutes. Also, the red beam light moves to slowly for my cat. I've two that absolutely love to play with laser lights, a few that think they're fun once in a while, and a few that think the others 'lost their mind' when they chase them! Technical issues aside, the product works well and my cats love it! Amazon was quick to provide a replacement that worked ... for about 2 weeks and then the motor stopped working, and then the laser. Now When I'm doing work on the computer and the cat wants to play I can finish my work in peace. Stopped working after 2-3 days of manual use. Then, it'd just not work that well in automatic mode. It seemed to work well for about one day. But replacement they sent works great. My cats love laser light toys in general and seem to like this product. We bought a replacement one at Petco and it worked just fine. Our cats enjoy chasing this laser light. One of my Cats is a "skitty" cat! Spend the money for your cats. My cats aren't interested in it. It's a predictable ellipsis where my older cat sits waiting for the light to pass by him to bat at it and my... less smart cat stares directly at the light. We've 5 indoor-only cats and this's the best cat toy we've purchased. I bought this new laser for two cats, whose old laser broke, and this's the best cat laser I've ever had. That being said, the person who's able to build a cat toy that keeps a cat interested long term, well, they'll be the hero and many and never need for money again. Loud motor - Our cat was more interested it the noise than the laser. My cats weren't that interested in it until I did this. My cat really loves this toy. I mean: love, love, love. Both of our cats love this product. The cat loves the red dot toy. Cats love it and I love not having to use tiny mouse light with circle batteries that die fast..
We all know how much cats love lasers. 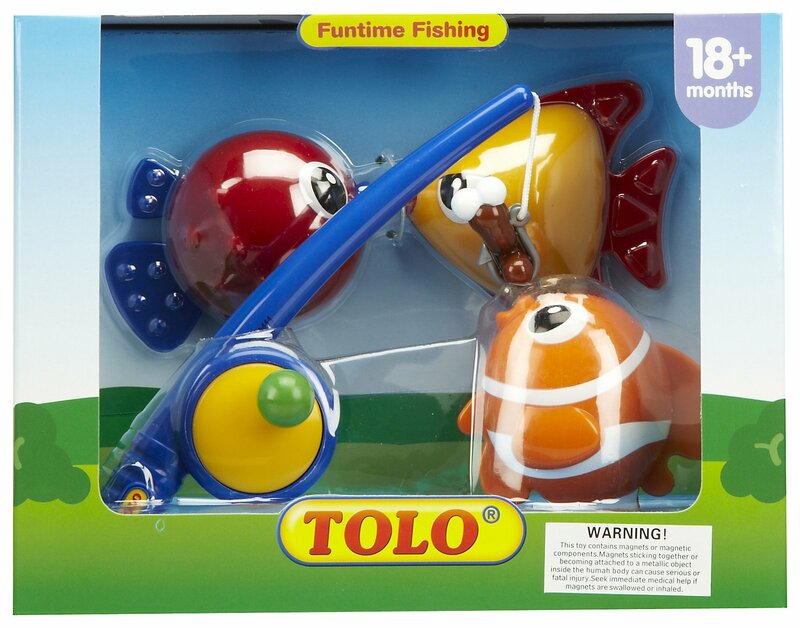 My cats loved this toy, it was so much fun chasing the random laser around. I've 4 cats, and 3 of them love it, the other is our older cat who likes different toys. You'd think a cat would love this thing. My cats never get tired of playing!. my five cats become so crazy playing with this laser toy. I bought this gift for my husband because he loves to play with my cat. My cat loves to play with this and so does my husband. We must be some of the laziest cat owners I know; we're too lazy to even pull out the laser pointer to play with our cats. 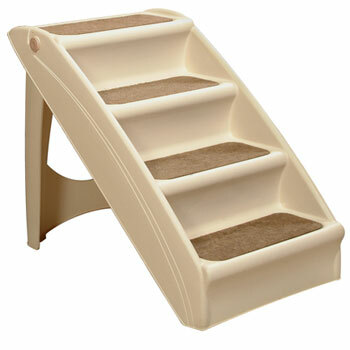 One of our cats has a ton of energy and loves playing with this. Always supervise your cats and children when they play with any toys, especially lasers. I love the bolt laser toy, no more bore cats !!. I've a few other automatic cat toys (the panic mouse 360 and panic mouse undercover) but this's the only one BOTH my cats will play with, and the battery life seems better so far. "Entertain you and your cat with automatically generated red laser patterns". My cats LOVE to chase the red dot! Well, I love the idea, but the pattern is just not random enough for my cat to enjoy playing with it. CATS STILL LOVE THE LASER! Our cats love chasing lasers, but became bored with this one after a very short time, because the laser pattern kept repeating, and didn't take very long to do so. 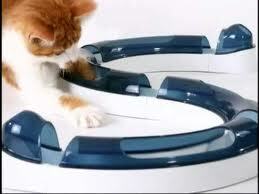 The SECOND replacement received definitely mixed reviews from the cats, both of whom love to play laser chase. It's true that isn't very random, but my cat still hasn't figured out the pattern well enough to be bored. Well, I felt I needed to respond - the one that I received goes in lots of random patterns, and the cats love chasing it. My cats absolutely love this laser toy. Some reviewers have noted that this toy only moves the laser in a pretty simple circular pattern, which can bore an intelligent cat.